This outfit is my new obsession! The weather is getting warmer which means brighter colors and not having to bundle up to survive. In Ames when it is 60 degrees you'd think its 90. But, I can't complain about perfect spring weather full of sunshine. Today's look is the perfect transition look from spring to winter. Wear a fun midi skirt with either tights or without for a covered but fun ensemble. I'm always cold so I tend to keep wearing tights until it is actually summer. But, this look is perfectly adorable without tights if your experiencing some awesome weather. Warmer weather also means putting away your boots and pulling out your flats and heels! I always get nervous to walk around in heels on campus during the winter because everything is so icy. But now I can take out some of my favorite casual heels like these purple mary jane Vince Camutos. Fun bright colors are my go-to all year round, but especially during the spring time. 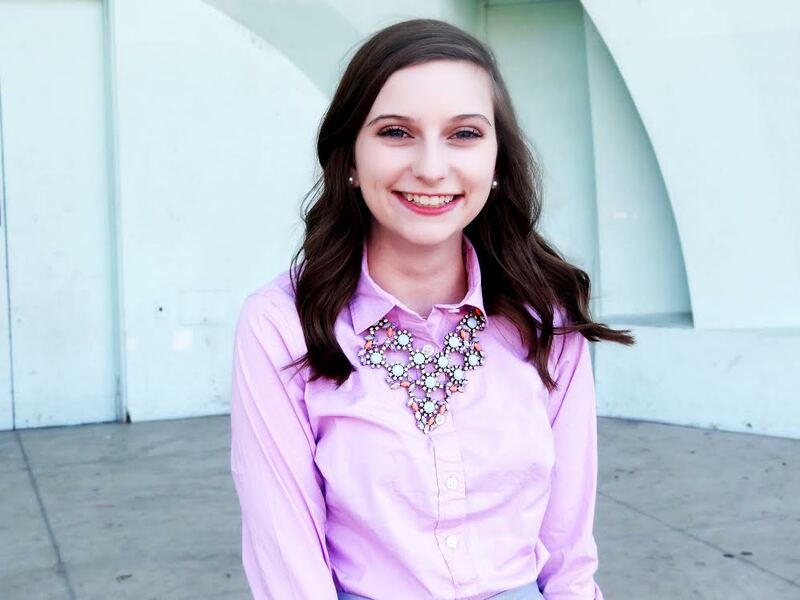 This pink purple shirt is perfect for pairing with darker pieces in the winter or pairing it with a soft color for the spring. As many of you pay know classic button downs are a staple of mine. So, I like finding unique colors so I can mix up my shirts from the traditional white and blue. Spring calls for big statements! By statements I mean statement necklaces. This necklace is one of my favorites because it surprisingly goes with a lot. 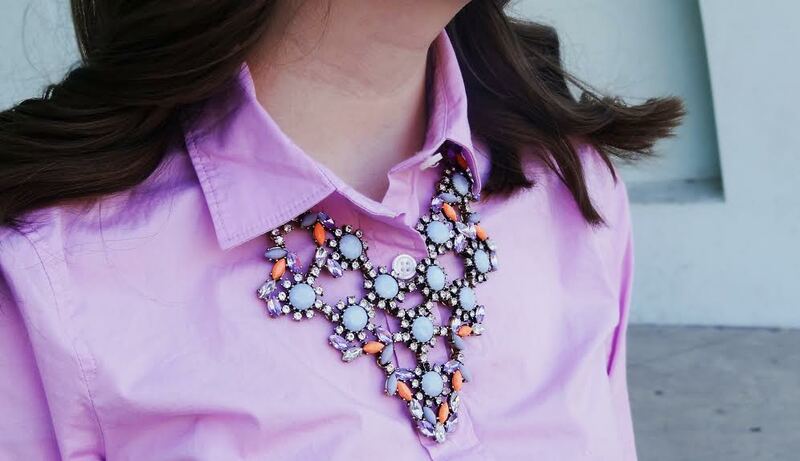 With orange, light blue, and pastel purple gems this necklace is perfect for any spring time look. I picked it up from J Crew a while back but they still have a ton of necklaces that could be your go-to statement piece this spring. To complete my jewelry look I kept my earrings simple with pearl studs and added a stack of my favorite Disney Alex and Ani bracelets I picked up on my last trip. Also, I wore my gold Michael Kors watch to add a touch of metallic shine. 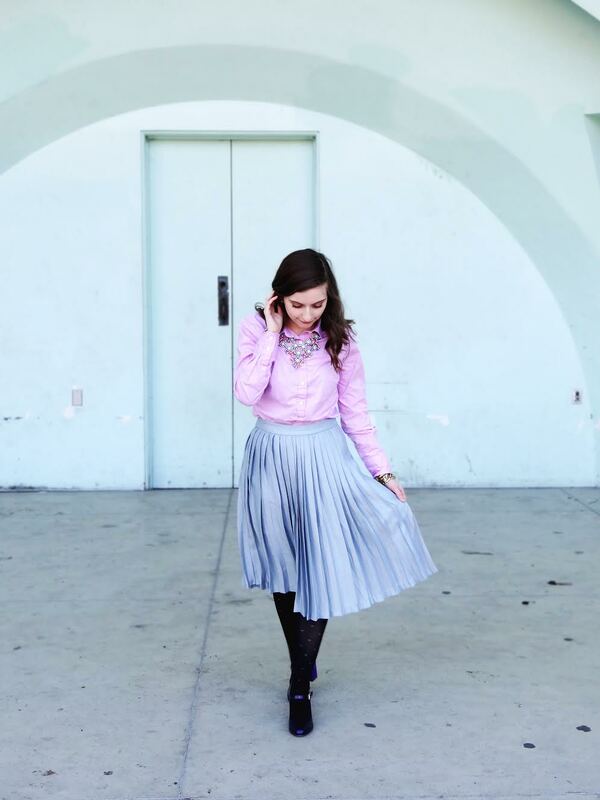 Pleats and tea length skirts are so in for spring! I love when feminine details are in style because it makes my life easier! Spring, for me, is all about adding more girly touches to match the season. Tip: If you're short but still want to wear a midi skirt I suggest pairing it with heels! It will make you seem longer and won't cut off your body lines. Also, try different styles on to see which looks best on you. Most midi skirts look ridiculous on me but I think this one works! Are you ready for spring? Let me know in the comments how your weather is doing! This outfit looks just stunning on you, girl! The pinks, the blues, that necklace - gorgeous gorgeous gorgeous! Thank you so much! I love all the colors in it :) thanks for reading!